Yesterfood : Share your "Best Of 2014"! Share your "Best Of 2014"! I love this time of year when everyone is publishing their "Top 10 Posts of 2014" or "Favorite Recipes of 2014". It's like watching the playoffs- you get to see the best of everyone's efforts for the entire year! As I was happily browsing through yet another talented blogger's "Best of 2014" collection, it struck me that some of you might enjoy these as much as I do. So link up your end of year "Best of 2014" post here, and join me in taking a look at the Best of the Best of 2014! 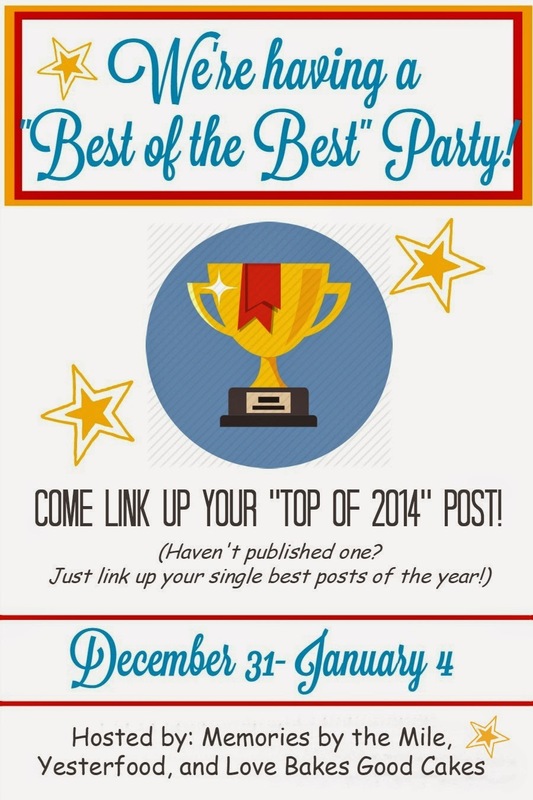 If you haven't written a "Best of 2014"post, just link up what your best single posts were- the ones with the most views or pins....or the ones that were your favorites! The BEST of Our Best! Bloggers' Best of 2014 Party on Pinterest. What a great idea, thanks so much for the party and Happy New Year! How fun!! Best wishes for a blessed and prosperous New Year, Joy!! Thanks for doing this, love the type of party! What a fabulous party! I'm excited to see the best of the best from everyone. Thanks for inviting me, Joy! Wishing you a joyful and prosperous New Year! What a cool linky party!! Thank you so much & Happy New Year! This is a great idea! Thank you for hosting and Happy New Year! What a fabulous party! Look forward to seeing everyone's best from the year! Thanks SO much for inviting me Joy... I'll have to put your Tues. party on my list! Would love to have you link up at our Thursday party as well (our first one for the year is on the 8th). Happy New Year! What fun! I will certainly check some of these out! Happy 2015 to everyone! Joy, what a fun way to review the year. I'm always surprised when I see something we posted that I still make and never think when it was created. Happy New Year! Joy, thanks for inviting your blogging friends to linkup our "Best Recipes of 2014". Hope you enjoyed your Christmas and a blessed and Happy New Year to you and your family! Happy New Year Joy! What a fabulous idea! Thank you for hosting! What a wonderful Idea! Happy New Year! I've just done my very first Year in Review after getting your email about this party! thank you so much for the Inspiration! I've seen many before, but never wrote one. So glad I was able to do it and come join you! Thanks so much for all you do, Joy! Many Blessings for your 2015!